Five character singles each featuring one of the five main characters clearly wasn’t enough. 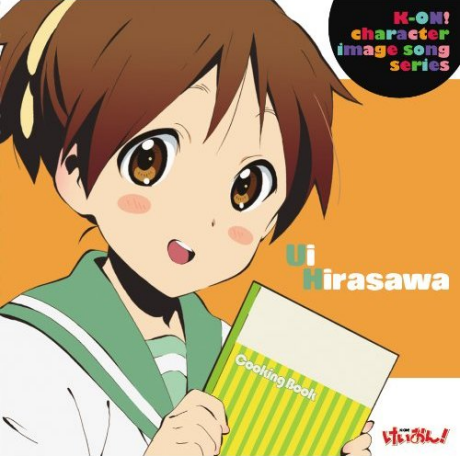 The third and final wave of the character image song series (for the first season, anyway) came about in October of 2009, and featured the “major” supporting cast members; Ui and Nodoka (Sawako didn’t get a character single, but then, the “Maddy Candy” single pretty much served that purpose). These two releases differ somewhat from the established pattern set by the previous entries in the series. There are no versions of “Let’s Go” to be found here, leaving each CD only two songs (and, as usual, instrumental versions of those two). Additionally, the cover design does not follow the same design scheme as the five main character singles. There isn’t a brightly colored ball in sight! 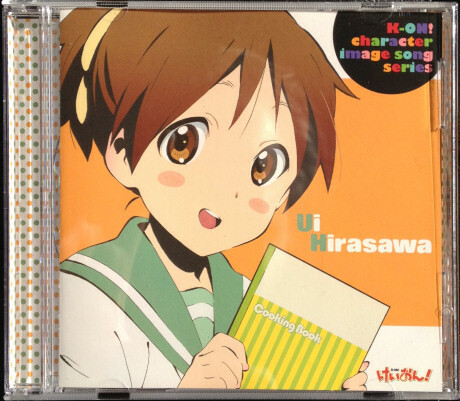 The cover of Ui’s single features her in her middle school uniform, holding a cook book, against an orange backdrop. The backside of the cover displays the track listing and a bunch of green and yellow lines. The song lyrics and credits are listed in a simple four page insert. 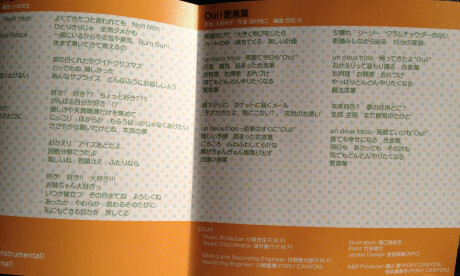 The design features lots of orange (Ui’s character color) and the actual lyrics are printed over a cutesy dotted pattern. 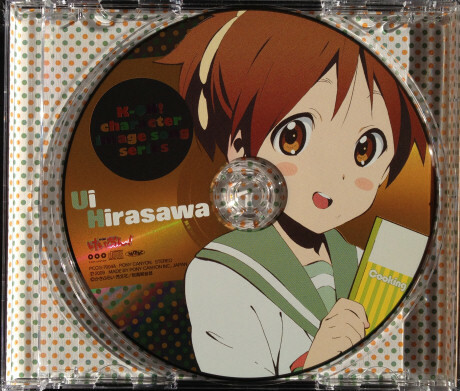 The CD itself features the same artwork as the cover. As I’ve stated in parts 1 and 2 of my character single review series, I’m actually not very fond of character singles in general and find the K-On! ones to be a bit of a mixed bag. Some are actually pretty good, while others can be annoying, or even just bland. So – where do Ui’s songs stand? 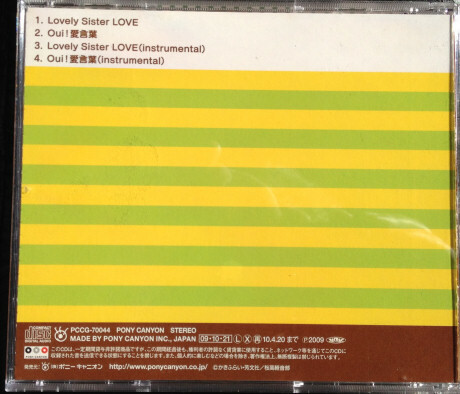 The first track is “Lovely Sister LOVE”. To be honest, I’m not loving it. For one thing, it’s a bit too cutesy for my taste – that probably sounds strange coming from a K-On! fan, but even for me there’s a point at which it becomes a bit too much. More importantly, though, I don’t like the lyrics. I think I mentioned before that when character songs are done right, they can give insight into the characters that you wouldn’t necessarily get from the anime – or at least, bring to the forefront aspects of their personalities that the story doesn’t take the time to dwell on. With this song, we get “Suki! Suki!! Daisuki!!! Onee-chan daisuki!”. They took the most blatantly obvious of Ui’s character traits and based the song on that. It just feels so… predictable. The second song, “Oui! Ai Kotoba”, gets points just for not going there. I also find it a bit more enjoyable overall, but it’s not likely to find its way to my list of favorites any time soon. 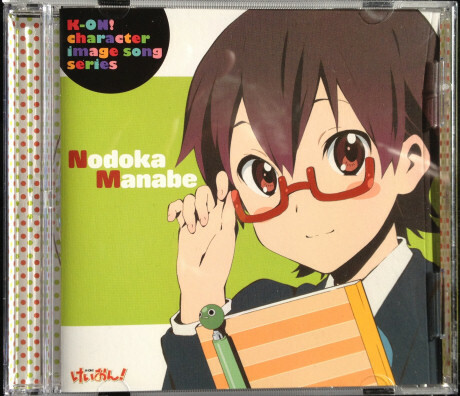 As for Nodoka’s single, it follows the same pattern as Ui’s. The cover design is pretty much the same, just with different colors. 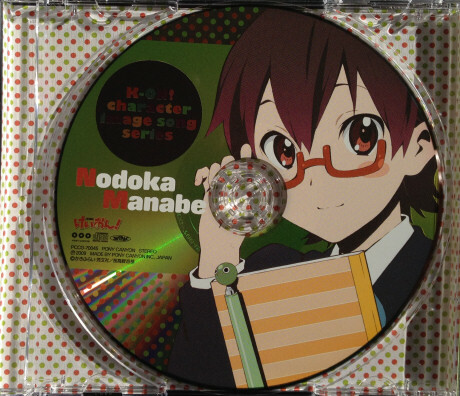 As one has come to expect, the disc itself features the artwork of Nodoka from the cover. I’m somehow unsure of what to make of the first song, “Coolly Hotty Tension Hi!!”. When I first heard it, I somehow felt it sounded familiar and decided it was clichéd and generic. Thinking about it now, though, I’m not sure if that’s really the case or if it just somehow managed to feel familiar due to being catchy. 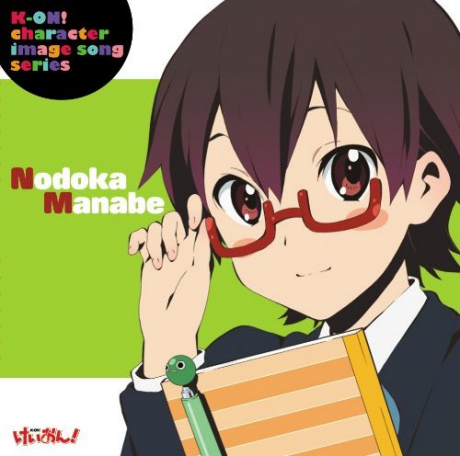 The lyrics are kind of generic – I don’t really see how they relate to Nodoka any more than random school girl X, but I can’t say I dislike the song. The last song is called “Prologue”. It’s a slower song that’s moderately pleasant to listen to, but doesn’t really do a whole lot for me. And that, I think, describes my feelings for the character single series overall fairly accurately. There is some good material to be found, but I can’t help but feel underwhelmed by some of the less exciting tracks. The ones I’ve ended up liking the most are Yui’s, Mio’s and Azusa’s songs, with Ritsu’s, Ui’s and Nodoka’s at the opposite side of the spectrum and Mugi’s landing somewhere in the middle. I said at the beginning of part 1 that I’m no big fan of character image songs in general, and that remains true. For K-On!, I find them a mixed bag and overall not as interesting as the music heard in the actual anime. But it’s still K-On! related music. And for me at least, that means it goes into the CD collection by default.